I would just use the 'sed' command. You can run a for each loop over all the files and parse out the "[!]". Otherwise I would suggest installing "rename" from homebrew if you have that installed. 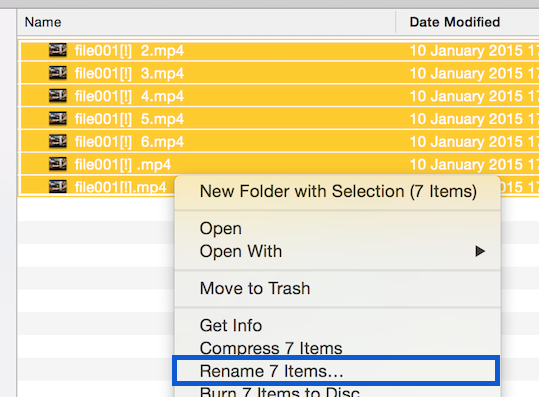 I also have a Automator right click service that does batch rename's if you would like a graphical way. Yosemite features a graphical way to do this. Select all the files you want to rename, Control-click on them, select "Rename x Items...", and you'll get what is basically a find-and-replace window for file names. In your case, select "Replace text" and substitute "[!]" with the empty string. Not the answer you're looking for? Browse other questions tagged terminal trim . Adding SSD to MBP (2012). TRIM?